This is from a response to a series of questions from somebody in Swansea West about protecting our community from environmental damage, referring to the manifesto of the CPRE. I would argue that all these issues have been aggravated by austerity and the willingness of the entire political establishment to make cuts. As a representative of the Trades Unionist and Socialist Coalition (TUSC), I'm proud to say that I stand on the platform of the only 100% anti-austerity party contesting the election. In your email you talk about "short term economic needs" dominating the political agenda. I would say that this is the nature of this economic system we live under, capitalism. TUSC is socialist because we believe society should be organised for the needs of people and communities and not for the profits in the pockets of a rich few. I'll answer some of the points you raise about housing, sustainable transport and the voice of local communities in planning in a bit more detail. TUSC recognises that there is a desperate need for affordable housing. We would argue that this would be best provided by providing new council housing. As you point out, new housing has to be built in the right places; it is important for the well-being of those who live in our communities that we retain our green spaces. At the moment Swansea's Labour Council is proposing to sell off playing fields at my son's primary school. New housing doesn't necessarily mean building on new land; there are a lot of unused buildings in Swansea (some of them owned by the Council). Where possible these could be developed to provide affordable housing. New housing should use sustainable materials and incorporate the best energy-saving technology. I definitely think the needs and feelings of communities need to be given more weight in the planning process. How can it be right that for instance, giant energy companies are able to ride roughshod over the opinion of the local community and their fears for the future of their environment, in the interests of fracking? With a number of firms interested in fracking or fracking-related processes for Swansea Bay and the Loughor estuary, Swansea residents may soon be testing for themselves, the limits of how much attention is paid to local residents' concerns in the planning process. Swansea TUSC supporters will campaign alongside all those opposing fracking and other processes that will damage our environment. I am certainly in favour of improving public transport both in order to make transport sustainable, reducing the environmental impact but also because I think it would improve the well-being of transport users. I don't drive and, as a regular user of public transport, I can testify that it is increasingly difficult to use public transport for everyday purposes, like travel to and from work. It is expensive and timetables are often infrequent. Competing companies don't co-ordinate times and refuse to accept each others' tickets. I'm in favour of bringing public transport into democratic public ownership beginning with the nationalisation of the rail network. Nationalisation of the railways would be enormously popular but despite overwhelming support at their own party conferences, the Labour Party will still not back it. It is not an accident that the first trade union to formally back TUSC is the RMT, which represents rail workers. 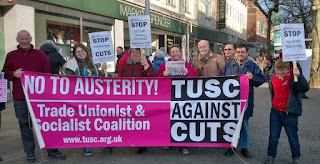 On these and other questions TUSC is able to give an unequivocal answer, we will develop policy based on the needs of the mass of ordinary people never, as is the case now, for the profits in the pockets of a rich few.